It is rare for any Council Member to label those who oppose her views as liars, enemies, and combatants, but this one has made it clear she is battle ready and has played fast and lose with some numbers to make it seem as though 92% of all of Chinatown wants the BID, which is simply not true. Margaret Chin and Wellington Chen conspired to bolster their ballot count by TARGETING residential condo owners who would be paying $1.00 a year into a BID. So before Chin starts pointing fingers and crying foul, perhaps some introspection is in order about how those ballots were obtained in the first place. That is, those ballots which have never been vetted through any neutral party. According to Aline Reynolds of the Downtown Express: "Contrary to opponents’ claims, the annual assessment fee does not rise with real estate taxes, B.I.D. proponents said. The fees would only change with a majority vote from the B.I.D. board of directors and a final stamp of approval by City Council. “It’s the single biggest lie the B.I.D. opponents have been telling. Assessments stay [the same] no matter what happens to your property taxes,” said Smith. Pat Smith of Rubenstein PR may be an expert at "spin" but is not an expert with BID fees ! One only has tolook at the BID fee formula to calculate the assessment tax from the public hearing notice. it's in black & white that the assessment is included into the formula for the Class A calculation. If there is one variable in the formula changes, the answer will change. This means that the BID assessment tax will vary from year to year. Property owners know that assessment rates will be subject to change from year to year. Ask them to explain how that number will not change if it is included into the formula. Any sample copy of a property owner's property tax billing notice (can use any block & lot found online at the finance website) will prove this example. Rates have continued to increase and not decrease over the years. Owners of 562 Chinatown small properties filed the required notarized statements and deeds within the mere 30 days allotted to organize and express their written opposition to Councilmember Margaret Chin’s fierce advocacy to form a Chinatown Business Improvement District. The large number of objections to the B.I.D. was historic according to the City Clerk’s office. Yet Chin says we have used “intimidation tactics” to garner support. 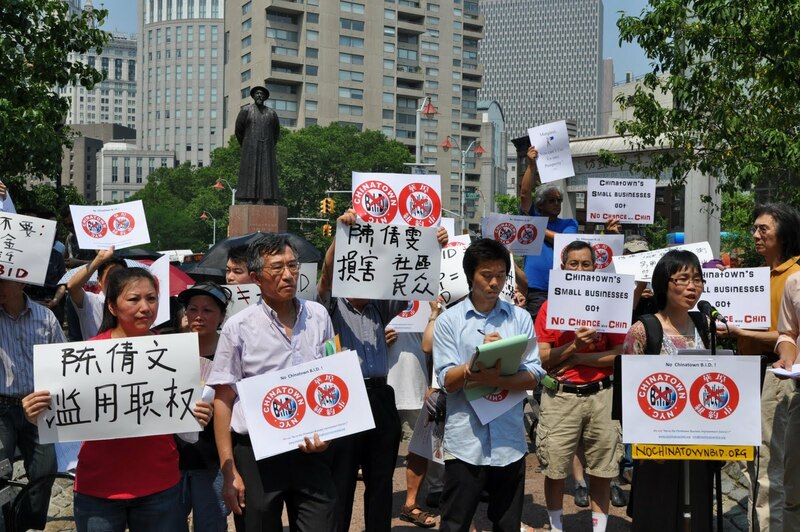 This is an insult to the intelligence of these property owners who are adamantly opposed to a Chinatown B.I.D. If anything, we took the time to educate property owners as to the true implications of a B.I.D. We even translated into Chinese the actual objection form, which no one else had done. Pat Smith of Rubenstein Associates Public Relations firm, (who is also the official spokesman for the proposed Soho B.I.D.) along with Margaret Chin and Wellington Chen have launched a campaign in the past few weeks defaming us and calling us liars in both English and Chinese language media. If anything, this only demonstrates their desperation and disrespect for the very people who are preserving Chinatown’s small businesses. Chin has chosen to sugar coat the B.I.D. fees and disassociate it from a permanent tax. The one-time $1.9 million government funds being withheld from the community and offered as an incentive only if a B.I.D. is formed is actually “bait” money that unfairly influences the process of B.I.D. formation. Once the B.I.D. is formed the taxes and fees shouldered by the property owners and businesses will, in essence, be permanent. Despite the B.I.D.s claim that their board can vote itself out of existence at any time, this is has no basis in reality. B.I.D.s in the past have never been dismantled because they are deliberately designed to make it virtually impossible to deconstruct. Councilmember Chin founded the Chinatown Partnership, garnered campaign funds from its members and lobbied for its transition to a B.I.D. for years. Why is Margaret Chin dismissing and disparaging the concerns of the immigrant community that elected her by accusing opponents of her B.I.D. of intimidation and lies? Is she now the official mouthpiece for real estate developers in Chinatown and Soho? With having used all these resources, including her influence on the City Council, who has she really been intimidating?